The Easter Bunny (also called the Easter Rabbit or Easter Hare) is a folkloric figure and symbol of Easter, depicted as a rabbit bringing Easter eggs. Originating among German Lutherans, the "Easter Hare" originally played the role of a judge, evaluating whether children were good or disobedient in behaviour at the start of the season of Eastertide The Easter Bunny is sometimes depicted with clothes. In legend, the creature carries colored eggs in his basket, candy, and sometimes also toys to the homes of children, and as such shows similarities to Santa Claus or theChristkind, as they both bring gifts to children on the night before their respective holidays. The custom was first mentioned in Georg Franck von Franckenau's De ovis paschalibus (About Easter Eggs) in 1682 referring to a German tradition of an Easter Hare bringing Easter eggs for the children. The hare was a popular motif in medieval church art. In ancient times, it was widely believed (as by Pliny, Plutarch, Philostratus, and Aelian) that the hare was ahermaphrodite. The idea that a hare could reproduce without loss of virginityled to an association with the Virgin Mary, with hares sometimes occurring inilluminated manuscripts and Northern European paintings of the Virgin and Christ Child. It may also have been associated with the Holy Trinity, as in the three haresmotif. Eggs, like rabbits and hares, are fertility symbols of antiquity. Since birdslay eggs and rabbits and hares give birth to large litters in the early spring, these became symbols of the rising fertility of the earth at the Vernal Equinox. Rabbits and hares are both prolific breeders. Female hares can conceive a second litter of offspring while still pregnant with the first. This phenomenon is known assuperfetation. Lagomorphs mature sexually at an early age and can give birth to several litters a year (hence the saying, "to breed like rabbits" or "to breed like bunnies"). It is therefore not surprising that rabbits and hares should become fertility symbols, or that their springtime mating antics should enter into Easter folklore. In addition, Orthodox churches have a custom of abstaining from eggs during the fast of Lent. The only way to keep them from being wasted was to boil or roast them, and begin eating them to break the fast. As a special dish, they would probably have been decorated as part of the celebrations. Later, German Protestants retained the custom of eating colored eggs for Easter, though they did not continue the tradition of fasting. Eggs boiled with some flowers change their color, bringing the spring into the homes, and some over time added the custom of decorating the eggs. Many Christians of the Eastern Orthodox Church to this day typically dye theirEaster eggs red, the color of blood, in recognition of the blood of the sacrificed Christ (and, of the renewal of life in springtime). Some also use the color green, in honor of the new foliage emerging after the long-dead time of winter. TheUkrainian art of decorating eggs for Easter, known as pysanky, dates to ancient, pre-Christian times. Similar variants of this form of artwork are seen amongst other eastern and central European cultures. The idea of an egg-giving hare went to the U.S. in the 18th century. 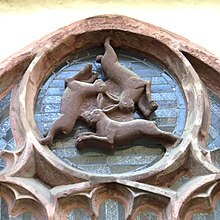 Protestant German immigrants in the Pennsylvania Dutch area told their children about the "Osterhase" (sometimes spelled "Oschter Haws" Hase means "hare", not rabbit, and in Northwest European folklore the "Easter Bunny" indeed is a hare. According to the legend, only good children received gifts of colored eggs in the nests that they made in their caps and bonnets before Easter. In his 1835 Deutsche Mythologie, Jacob Grimm states "The Easter Hare is unintelligible to me, but probably the hare was the sacred animal of Ostara". This proposed association was repeated by other authors including Charles Isaac Elton  and Charles J Billson. In 1961 Christina Hole wrote 'The hare was the sacred beast of Eastre (or Eostre), a Saxon goddess of Spring and of the dawn'. The belief that Ēostre had a hare companion who became the Easter Bunny was popularized when it was presented as fact in the BBC documentary Shadow of the Hare (1993). Sarah Ben Breathnach in Mrs Sharp's Traditions (1990) provides an origin story for the Easter Bunny: "According to legend, Eostre's favorite animal was a large handsome bird, which in a fit of anger she turned into a hare." Another version of this story, in which Ēostre transforms the bird into a hare in an act of mercy, was written by Jean-Andrew Dickmann and appeared in Cricket magazine. Both Breathnach and Dickmann present their respective 'transformed bird' stories as if they were legend, though no earlier version of either has been attested.